The Department of Agriculture & Cooperation (DAC), Ministry of Agriculture, Govt. of India launched Kisan Call Centers on January 21, 2004 across the country to deliver extension services to the farming community. The purpose of these call centers is to respond to issues raised by farmers, instantly, in the local language. There are call centers for every state which are expected to handle traffic from any part of the country. Queries related to agriculture and allied sectors are being addressed through these call centers. A farmer from any part of the State can contact the Kisan Call Centre by dialing the toll free Telephone No. 1551 or 1800-180-1551 and present their problems/queries related to farming. The operator at the Kisan Call centre will attempt to answer the problems/queries of the farmers immediately. In case the operator at the Call Centre is not able to address the farmer's query immediately, the call will be forwarded to identified agricultural specialists. For Meghalaya, the Agriculture Information Officer and the Horticulture Officer, Department of Agriculture are currently the designated specialists. The challenges before Indian Agriculture are immense. This sector needs to grow at a faster rate than in the past to allow for higher per capita income and consumption. It is an accepted fact that the sound agricultural development is essential for the overall economic progress. About two thirds of workforce directly or indirectly dependent on agriculture. This sector generates about 28 percent of its GDP and over 15 percent of exports. Rising consumer prosperity and the search by farmers for higher incomes will simultaneously drive crop diversification. Export opportunities for agricultural products are also expected to continue to grow, provided India could meet the stability, quality and presentation standards demanded by foreign trade and consumers and maintain its comparative advantage as a relatively low cost producer. Given its range of agro-ecological setting and producers, Indian Agriculture is faced with a great diversity of needs, opportunities and prospects. The well endowed irrigated areas which account for 37 percent of the country's cultivated land currently contribute about 55 percent of agricultural production, whereas, rainfed agriculture which covers 63 percent accounts for only 45 percent of agricultural production. In these less favorable areas, yields are not only low but also highly unstable and technology transfer gaps are much wider as compared to those in irrigated areas. If it is to respond successfully to these challenges, greater attention will have to be paid to information-based technologies. Strengthened means of dissemination will be needed to transmit this information to farmers. Both technology generation and transfer will have to focus more strongly than ever before on the themes of optimization in the management of their available resources by producers, sustainability, coping with diversity by adapting technology more specifically to agro-ecological or social circumstances and raising the economic efficiency of agriculture. To make information transfer more effective, greater use will need to be made of modern information technology and communication among researchers, extensionists and farmers. At present, the issues have been addressed by the Extension Systems of State Departments of Agriculture, State Agricultural Universities (SAUs), KVKs, NGOs, Private Extension Services through various extension approaches in transfer of technology. A limitation in Transfer of Technology (TOT) model continues to remain a challenge for the public and private extension systems. With the availability of telephone and Internet, it is now possible to bridge this gap to quite a large extent by using an appropriate mix of technologies. The Kisan Call Center is a synthesis of two hitherto separate technologies namely, the Information & Communication Technology (ICT) and the Agricultural Technology. Both have their specialized domains and work cultures. 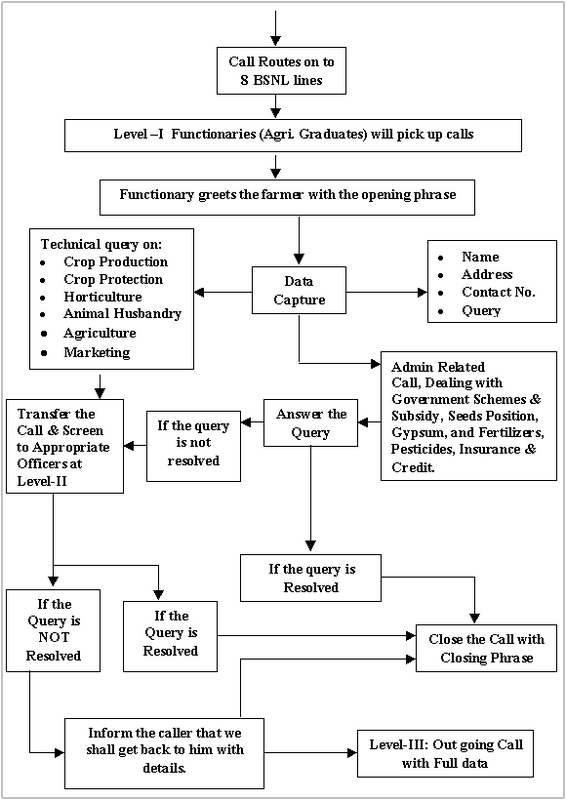 To optimally utilize the strengths of both these systems, it was proposed to take full advantage of professionally managed Call Centre mechanism and dovetail it with the specialized Subject Matter Specialists knowledge of Agricultural Scientists and Extension Officers, so as to facilitate its reach to the farming community. It is accordingly proposed to make use of existing specialized infrastructure of Call Centers (which are normally industry-driven and serve to high-end and many a times, mission critical service sector) and make this communication backbone available to the Subject Matter Specialists of Agriculture, Horticulture, Animal Husbandry, Marketing and other related areas. The Kisan Call Center, consists of three levels namely Level-I (the basic Call Center interface, with high quality bandwidth and local language proficient Agriculture Graduate), Level-II (Subject Matter Specialists on concerned important crops and enterprises, connected through good bandwidth telecom and computer connectivity) and Level-III (the Management Group to ensure ultimate answering and resolution of all the farmersâ€™ queries which are not resolved at Level-II, connected on off line mode). Level - I: The call coming to the call center is picked up by an operator (level â€“I functionary) who after a short welcome message takes down the basic information and the query of the caller. These details are fed into a computer located next to the operator by the operator himself. And the first level receiver of the call would also feeds into the computer the question being asked by the farmer. The first level operators preferably would be an agricultural graduate with rural background knowing local language. They should also possess good communication skills. They would be in a position to answer a majority of the questions likely to be asked by the farmers. The level -II consists of Subject Matter Specialists (SMS) who are located at their respective place (Research Stations, ATICs, KVKs, Agricultural colleges), of work. In case the first level operator is not able to answer the question, the operator forwards (in call sharing mode) the call to the concerned Subject Matter Specialist. The data relating to the caller including the question asked is also be transferred to the Level-II functionary on his computer along with the call. Hence, when the specialist takes the forwarded call, his computer also shows the data and question asked so that there is no repetition. It is envisaged that in normal cases, the entire spill over questions from the first level get answered at this level. In case, it is not possible to answer, there is a system to revert back to the caller by post / fax / e-mail or by telephone in 72 hours. Level - III: The level - III consists of a dedicated cell located at the Nodal Office. This would receive the questions that have not been answered at the first and the second levels. Appropriate replies to these questions whould be then framed in consultation with the concerned specialists available within or outside the State, by the nodal cell. The replies would be sent to the farmers promptly by post/e-mail/fax/ telephone etc. within 72 hours of receipt of the question. The technical infrastructure at Level-I is the most critical and complex. The farmersâ€™ call lands on a switch in BSNL and the same is transferred to one of the 8 hunting lines (on first come first serve basis) at the Call Center premises. Here there will be two Agriculture Graduates picking up these calls and capturing data. To facilitate this, the hunting lines will have interface with Local Area Network (LAN) at the premises of a Call Center. Two nodes of LAN (with two computers, two telephones with head phones and tele-conferencing facility, support of the server and Internet connectivity) will be dedicated to Kisan Call Center. The entire backup support system consisting of Uninterrupted Power Supply (for both server and the nodes), Air-conditioning System and other logistics will be made available by the Call Center. The responsibility of the Nodal Officer is to see that two Agriculture Graduates are placed to serve as Level-I functionaries as Agri-communicators at the identified Call Center. The whole technical infrastructure at Level-I (including dedicated line with a toll free number identified by Ministry of Agriculture, Govt. of India) will be owned and maintained by Call Center Management. It is proposed to have a Response Center in the working territory of each Institution or Agency, who will provide services of Level-II functionaries. The basic infrastructure at Level-II includes a dedicated high bandwidth telephone line (preferably 128 kbps ISDN line), a Desktop Computer System with Internet connectivity, one printer and a 2 KVA UPS system and appropriate logistic support in terms of an exclusive room with air-conditioning. This will be organized by the Nodal Agency at the identified resource institutions. The Level-III operations will be managed at the identified Nodal institutions. The basic infrastructure at Level-III will include a dedicated high bandwidth telephone line (preferably 128 kbps ISDN line), a Desktop Computer System with Internet connectivity, one printer and a 2 KVA UPS system and appropriate logistic support. The Level-III is supposed to be manned by a Senior Officer from the Nodal Institution. The infrastructure will also include appropriate software for analysis of call data and reporting mechanism (with provision for daily, weekly and monthly reporting systems with support on crop / enterprise wise, region wise and issue wise reports). This system demands a support of an ICT Facilitator of the Nodal Institution to continually support proper logging, analysis, documentation and reporting at Level-III. This will be organized by the Nodal Institution at their own premises. Give patient listening to understand the local conditions and Farmer's situation for the query he raises. Diagnose the problem by probing the details. Answering the query at the level of farmer's knowledge. Relate with local experiences, if possible. Avoid use of unnecessary and complex words and sentences. Basic knowledge of key board and mouse. For successful functioning of Kisan Call Centers, there is a need to monitor and review the various activities of the KCC by the Nodal Institution on regular basis. The Nodal Institution is responsible for documenting the daily activities of the Kisan Call Center at various levels on farmersâ€™ queries and their resolution, availability of Subject Matter Specialists, call dropouts and their transfer to Level-III and response to the farmers within 72 hours. The Nodal Institution will also organize fortnightly meetings with the Heads of Departments of Response Centers for first 6 months to ensure the proper identification and placement and changes if necessary of Level-II functionaries and resolution of the queries shared with Subject Matter Specialists and their documentation. Subsequently, these meetings will be held every month in Response Centers on rotation. The Department of Agriculture & Cooperation (DAC), Ministry of Agriculture (MOA), Govt. of India will review the functioning of all the Kisan Call Centers with the Heads of Nodal Institutions every month to start with for first six months and subsequently for every quarter in each of the Nodal Institution on rotation basis. The Nodal Institution is responsible for documentation and reporting. The Officer In-charge of the Nodal Institution will gather the reports from the Kisan Call Center / Response Centers and prepare a consolidated statement on farmersâ€™ queries and answers, crop / enterprise-wise, along with the resolutions given at Level-III and report to the Department of Agriculture & Cooperation (DAC), Ministry of Agriculture (MOA), Govt. of India through e-mail on fortnightly basis. All the proceedings of the Kisan Call Center will be documented by each of the Nodal Institution and shared with other Kisan Call Centers for preparing a database on crop / enterprise-wise and also to prepare Frequently Asked Questions (FAQs).